The REAL Racists are "Proud" of Our "First Black President"
The JIDF doesn't see "race." 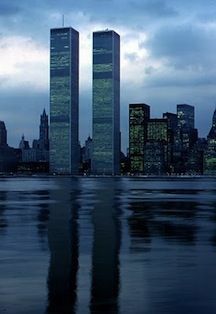 We thought America was beyond it. Apparently not. Commentators are "proud" of this "historic moment." This is quite a first. There's lots of them in this election. Perhaps we should also be "proud" of the the first president who launched his political career in the apartment of an unrepentant terrorist. Or the first president who belonged to a racist, antisemitic, anti-American, Hamas-promoting "church" for 20+ years. 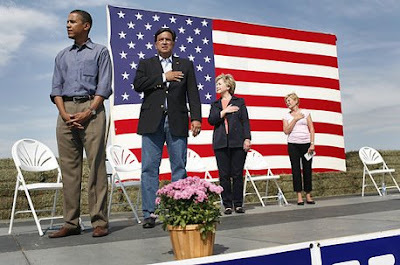 Or maybe the first president to not place his hand over his heart during the National Anthem. The first president who said he won't wear "that" (American) flag on his lapel. The first president who got into Harvard with the aid of an anti-Jewish key advisor to Saudi billionaires. The first president who attended the "Million Man March" by a man proud to be compared to Hitler, Nation of Islam leader, Louis Farrakhan. The first president with ties to radicals and terrorist organizations. The first president who announced that he will divide Jerusalem....the list goes on and on. Yeah, quite a list of "firsts" in which to be "proud." Yet the only one that is mentioned is that he is "black." How racist! The JIDF apologizes for being a "racist" for mentioning all these pesky inconsequential "firsts." By the way, did we mention how happy this is making Indonesian jihadists, Iran, Filipino Muslims, and the Taliban?